NBC’s singing competition show “The Voice” just finished its “Battle Rounds” and now moves on to a new turn of events, “The Playoffs”. Coaches, Blake Shelton, Shakira, Adam Levine, and Usher all must decide what three artists out of their five each to keep and take to the live shows which begin filming on April 21st. Blake was the first coach up. He had to hear all the members of his team sing individually a song of their choice, then at the end of the night decide which two would not be moving-on. Back stage Adam said Audra has never shown any weakness, and that he considers her a strong contender. Ryan is an ex garbage man. He decides to takes a risk by choosing to sing a big song. At home, he was juggling being a garbage man and doing gigs. The song he selected was, “Second Chance”. Ryan said he picked that song because it came out when his parents gave him an ultimatum of going into the Army. Blake said “He picked a song that is a tough song” and that he worries about him “blowing it out”. It’s Time For a Brovorce! Coach Blake said, “It takes him a second to catch his voice. I’m overwhelmed with excitement and pride and heart ache” Blake said because he makes it that much harder for Blake to decide his final team. Madilyn is a Junior in high school who loves to make short films and sing. She chose to sing “Clarity” by Zedd featuring Foxes. Blake said Madilyn “surprises you and hits those big notes.” He told her “this is your last shot”. Shakira said Jake will win everyone over. Blake said “Jake is the real deal.” Jake chose to sing “Anywhere With You” dedicated to his girlfriend he said who treats him like a “skinny man.” Blake said Jake has the ability to pick good songs. While on stage, Jake said to Blake, when his Dad looks at you and says something, he means everything he says. Blake said Jake is one in a million. Sisaundra said the song that she picked, “New York State of Mind” reminds her of “living in New York and all the sacrifices I’ve made by being on stage.” Blake told her, “I want you to perform this like you perform everything.” That, she did! Singing “New York State of Mind”. Blake Imitates Sisaundra Tricking-Out The Coaches! 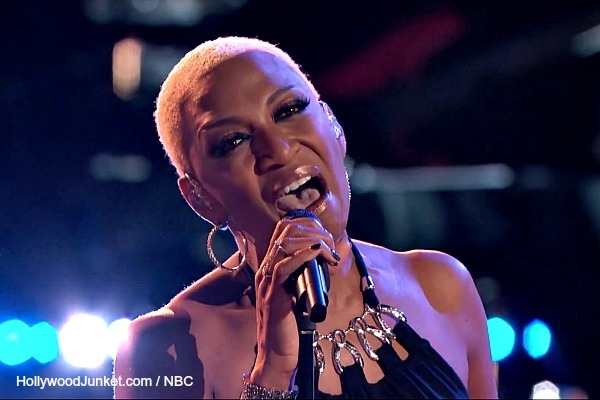 The New TEAM BLAKE: SISAUNDRA LEWIS, JAKE WORTHINGTON, AUDRA MCLAUGHLIN – Are going to the live shows! Next week it will be the other coaches turn to select their three artists that they will be taking into the live shows. Watch THE VOICE season 6 episode 17 “The Playoffs Premiere” first aired by NBC on Tuesday, April 8, 2014. This full episode is now available at HOLLYWOOD JUNKET until 06/19/14 courtesy of NBC. ENJOY!